Living in Texas you tend to fall in love with stars. Not actually stars, as in plural, but more like the singular. The lone star. They are everywhere and I have to admit that even though I didn't grow up here, I have fallen in love. So this fun tutorial for a leather belt star might just find a place on my mantel. If you have kids that are growing out of belts or if you happen to find some at a local thrift store it could be a pretty inexpensive project, and with the pieces you trim off for the first project, you could create this other fun leather belt star. 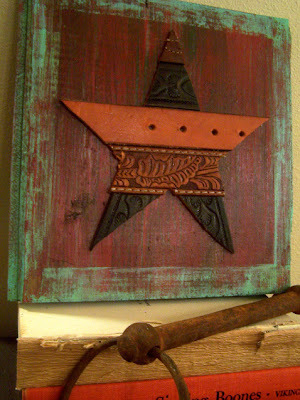 You can check out both leather belt stars over at Beyond the Picket Fence.